This River is Wild: The Oak. Every weekday I wake up at 5:15 a.m. to go to work. After awhile, your body gets in a groove and your automatic alarm becomes set at that time. There is nothing worse than waking up at 5:14 and looking at your clock thinking you can go back to sleep, only to realize that an annoying alarm tone is about to piss you off. With that in mind, I woke up at 5:14 a.m. in the bed of my pickup truck. My shoulders ached from a night spent sleeping on my casting shoulder and I struggled to realize where I was. The desolate Albion Walmart Supercenter parking lot was deserted save for a few cars. My suspicious looking truck lingered near the end of the lot away from all the worker's cars. I had about thirty seconds before my alarm went off, so I fumbled around for my glasses. The alarm screeched its tune and I quickly turned it off. Adam came stumbling out of the front seat and let me out of my chamber. I rolled out of the back just as a new shift came rolling in. The person in the car gave me a nice look after glancing at my sleeping bag. Who knows what he was thinking when he saw us stumbling out of that truck. We didn't care, it was time to go fishing. You Would Think This Would Work...But It Didn't. It was our second day fishing Oak Orchard river in western New York. 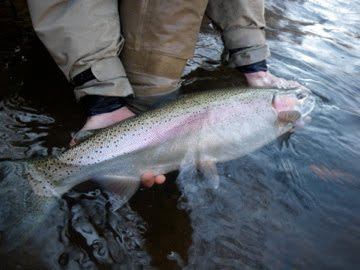 On the previous day I hit everything just right and landed several of the largest brown trout I have ever caught and some nice steelhead to boot. Adam had a terrible day, failing to land a single fish. That being said, we still had high hopes for round two. 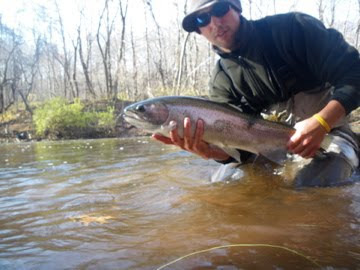 This particular Sunday, the weather was extremely warm and this brought a lot more anglers out to the river. It only took half an hour before Adam and I were slowly squeezed out of our first spots by several anglers who kept getting closer and closer. Being polite, I just packed up and went to the next open area. This day was much slower. The water level dropped over a foot, there were more people, and every fish in the system was probably caught the day before. Before our half day was over, we each managed to land a few fish each. 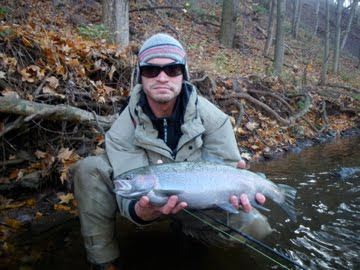 I was happy for Adam, who landed his first steelhead of the season. 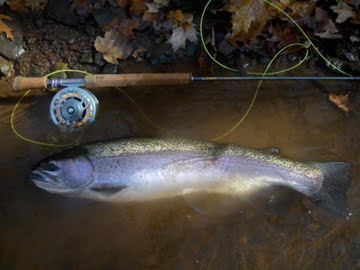 The two steelhead he caught were awesome fish that were in great shape. 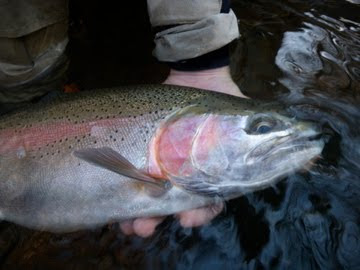 I managed one brown that closely resembled a mini-taimen and had a bulldog battle with a very thick steelhead. A little past noon, we packed it in and began the long journey home. Another successful round on the Great Lakes coming to a close. Only Brown Landed on Sunday. 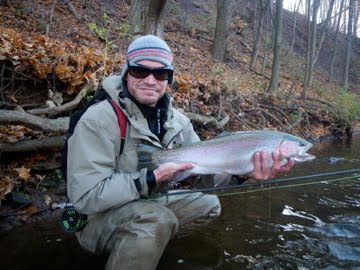 One Gorgeous Great Lakes Steelhead. Reflecting on the Past Two Days. the oak was not particularly kind to us. crowded and entertaining, but low and slow. congrats on the good trip! Thanks! I'll be fishing it this Thursday. 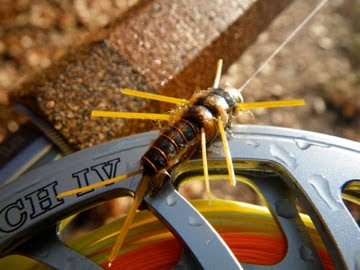 Going to be tough this week fishing the tribs due to the low flows. Should be interesting. I know exactly what you mean by "entertaining". 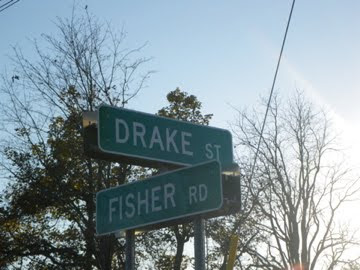 Was O.B. there to regale you as well? Good luck!